Giving your horse rubber mats as a stable bedding alternative has many advantages, for both you and your horse. Rubber mats can be used as a flooring in stables, both in combination with other bedding, and - depending on the type of mat - on their own as an all round bedding alternative. There are many different types available, and choosing the right design and material for your requirements is crucial to their success and durability as a stable bedding alternative. Non-slip protection for your horse, which also greatly reduces the risk of casting. Horses often slip and struggle when getting up from a concrete-floored stable, despite the layer of bedding which is easily scraped through. Rubber mats give a similar grip as a horse would have getting up from the ground outside in a more natural circumstance. Insulation from uncomfortable concrete flooring, whose cold and damp can often be felt by the horse even through a considerable thickness of straw, wood shavings and other bedding. Cushioning of the horse's joints, especially on studded rubber mats which are very shock-absorbing for the stabled horse, unlike most other forms of bedding. Massive reduction of dust in the stable atmosphere, especially if rubber mats are used without additional bedding. Odour: horse rubber mats which drain properly greatly reduce the ammonia vapor in the stable environment, compared to other bedding such as straw and wood-shavings which trap the urine. Although with rubber mats that drain, the urine does gather underneath to an extent (even with a gradient on the concrete) we find that the odor is almost completely trapped beneath the mats, where a natural septic breakdown occurs over time. It is only necessary to clean out underneath the mats once or twice a year. 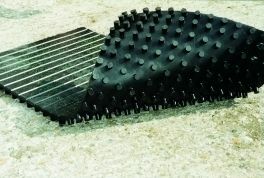 Rubber matting provides a much drier environment for the horse's hooves. Other forms of bedding may look dry, but even when they are frequently cleaned out they often conceal a high level of moisture. 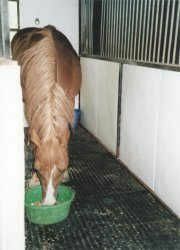 A solution to the problem of horses eating their bedding, however this does mean that adequate hay must always be provided to keep the horse's gut moving. Considerable reduction in labour and time spent mucking out - a stable with only rubber matting takes literally 5 minutes to sweep back and clean out. They can also be easily power-hosed and disinfected from time to time. Cost: horse rubber mats require an initial investment, but they pay themselves back with the money saved on buying other forms of bedding, and the time saved on labour. Storage: your storage space needed for bedding (straw, shavings etc.) can be considerably reduced, or almost completely eliminated if you use rubber mats on their own. The size of your muck-heap will also be significantly reduced. 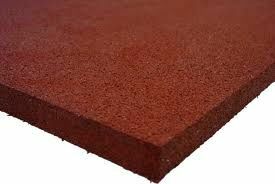 Horse rubber mats for stable flooring can be divided into two main types: those that are designed to allow drainage of urine underneath the matting, and those that are designed as a solid barrier and do not allow drainage. The non-draining mats need to be used in conjunction with some form of other bedding (straw, shavings, etc.) to absorb urine. They are therefore not a complete bedding solution in themselves, although they still provide many of the benefits listed above, such as cushioning and insulation. Those horse rubber mats that do allow drainage come in many different designs. Some have studs or grooves on the underside (photo, left), with slight gaps between the mats to allow drainage. Others are fitted onto a separate plastic grid (photo, right). Most horse rubber mats are non-porous, but some porous ones do exist. These are not a good idea for horses, as urine gets trapped within the mats resulting in an odor and cleanliness problem. Which Horse Rubber Mats to Choose? If you have concrete flooring in your stables, that has a regular surface and a gradient to permit drainage, then in our experience, solid non-porous rubber matting with integral studs on the underside, and slight gaps between the mats for drainage, are the ideal solution. We have used these kind of mats as self-sufficient stable flooring, with only a sprinkling of wood shaving on top, for the past 15 years, with great success. If you can find good quality pure, and ideally vulcanized, rubber mats, they have a very long lifespan. We are still using the original stable mats we invested in more than 15 years ago, from the UK company Fieldguard, and they show virtually no signs of wear. We would highly recommend this company's products for anyone in the UK and its vicinity. Many cheaper horse rubber mats are made of composite rubber 'crumb' - granules melted together, which are sometimes not pure rubber (photo, left). These mats are much less durable, and considering the wear that a stable surface is subjected to by a horse weighing around 500kg, and often (unfortunately!) wearing steel shoes, these type of mats are unlikely to be a good investment. We have also heard several bad reports from people who have installed porous rubber mats in their stables. They end up trapping urine which results in strong ammonia odours, and these mats also have little durability. When it comes to stable flooring, it is difficult for us humans to remember that horses are not nesting animals! We love the look of a big comfy bed to snuggle into, but this is not at all instinctive for horses, who, in their natural state, lie down and sleep on solid ground. 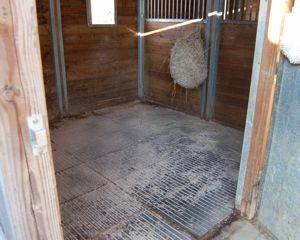 A rubber-floored box with little or no bedding may look to us bare an uncomfortable, but for a horse it is more important for them to be properly protected from the unnaturally hard and cold surface of a concrete stable floor (which, under the weight of a horse, makes itself felt even through thick bedding) than to have bedding to lie on. How much bedding you use in conjunction with rubber matting is therefore not really a question of comfort, but it can play a role in how mucky the stable gets. Some horses don't like urinating on the rubber surface as it splashes more than outside or on bedding. These horses will tend to 'hold-on' until they have a chance to urinate outside, and would probably be happier with some bedding if they were in for a long period of time (our horses very rarely are). Horse rubber mats stay very clean when the droppings etc. are swept back or removed fairly regularly, but obviously when horses are kept in overnight there is more mess, depending on how clean the individual horse is. This does mean that the horse and/or his rugs may get a bit dirtier than with other forms of bedding. When we brought our horses in regularly, they came into the stables during the day, and went out at night. Rubber matting with no extra bedding was ideal for this routine, as the stables stayed clean and our mucking-out time was very short for the number of horses we have. However, for horses coming in regularly at night, you may find it more practical to provide a small amount of bedding. This just requires a trial-and-error approach to find out what works best for your scenario. Rubber mats are also a very useful fixed onto the walls of a stable (photo, left), both to protect the stable from kicking, biting and so on, and to give cushioning to the horse. They also add to the insulation of a stable in cold weather. Special lightweight rubber mats are available for this purpose. Rubber mats are very good flooring on any stable-yard areas that are prone to slipperiness - sloped concrete ramps, washing and tying areas, crushes, and of course in trailers and horseboxes. The extra grip they provide can help to avoid serious accidents. You will find many different types of mats adapted for these difference uses, as well as pour-on liquid rubber.